All students initially learn best through hands-on activities. Go into any early elementary classroom and observe students during math class using counting blocks and other manipulatives. Students learning to use and create charts often use hands-on activities, such as the M&M bar graph activity (grouping M&Ms by color then creating a bar chart with their findings). In 21st century classrooms, students continue to learn first through hands-on activities before learning to produce the chart in a digital format. Elementary students are learning to create and use simple bar charts digitally; students with visual impairments also need to know how to create and use digital bar charts while using a screen reader. In the classroom, divide the leaves into groups. Groups might be by color, size, shape or type (tree names). Teacher Hint: If a totally blind student is in the class, do not divide the leaves by color. 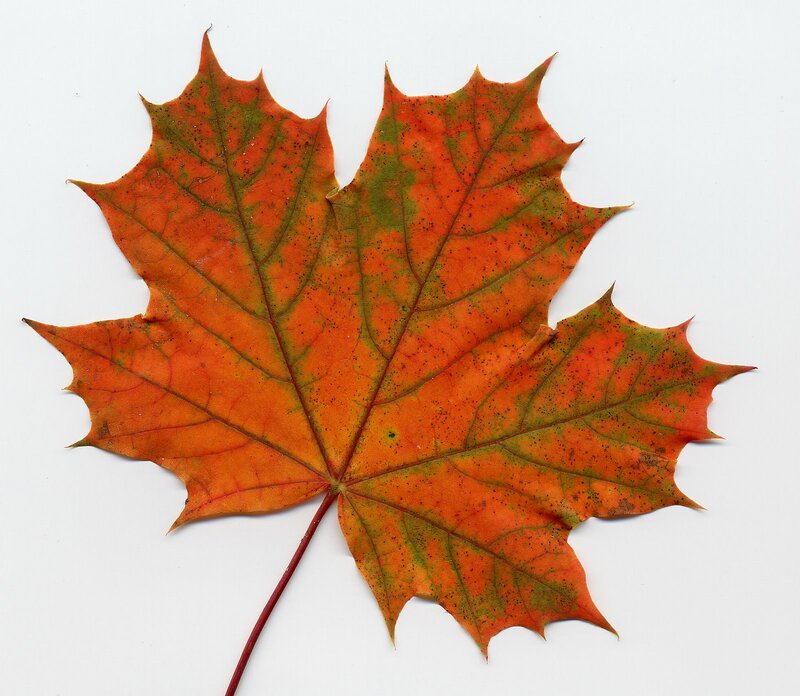 Teacher Resources: Attached are clear images of a Red Oak, White Oak, Tulip, Maple, Hickory and Birch leaves. These individual leaves (or substitute leaves of trees in your area) can be used to help students determine what kind of leaves they have found. Students can also do an Internet search using a kid-friendly search engine to identify their leaves. Print each leaf on a construction paper (or braille paper) and cut out for students who are visually impaired. Using masking tape, mark off a grid on the floor. The grid columns will list your categories. (Example: If dividing by color, there will be one column for each color. The image on the right shows a grid on the floor created by masking tape. There are four columns labeled: yellow, orange, green and red. The grid boxes are either empty or have one leave per box. Yellow: 1 leaf; Orange: 2 leaves; Green: 4 leaves; Red:3 leaves. If dividing by tree type, there will be one column for each tree type (My example below: Red Oak, White Oak, Tulip, Maple, Hickory, Birch). Determine the category with the highest number of leaves (My example below had 6 White Oak leaves). My chart is a 6 x 6 grid. Write each category on an index card; if a braille student is in the class, be sure to braille the index cards. Place leaves in the appropriate squares – only one leaf per square. Young elementary students in digital classrooms are creating and using digital bar charts. For students using an iPad, create accessible bar charts in the Pages app. These bar charts are accessible with VoiceOver. Select the Add button (VoiceOver calls it Insert button). Tap the chart for the popup menu and select Edit Data. An editable table format is now available. The sample table has 2 Regions. Delete all the information related to Region 2. Substitute the sample information with your desired information. Substitute Region 1 with the desired title of your chart. (My example chart’s title is “Type of Fall Leaves”. Always teach students to read the title, the kind of chart, X and Y axis information before looking at the chart data. The image below is a screen shot of the Edit Chart Data screen which is in a table format. At the top of the columns are the X axis categories: Red Oak, White Oak, Tulip, & Maple. (Other categories are off the visual screen and require a three-finger scroll left.) The second row has the title, "Type of Fall Leaves" and corresponding Y axis numbers: 5, 6, 5, & 5 with the remaining numbers off the visual screen. The third row is blank; Region 2 data has been manually deleted. "Type of Fall Leaves bar chart. Y Axis range: 0-6. X axis: Red Oak, White Oak, Tulip, Maple, Hickory, Birch" The chart is a typical horizontal bar chart with the same data that was in the table format above. Below is a video demonstrating this Pages bar chart using VoiceOver. Type X categories in Column A. Type number of leaves in Column B. Select columns A & B. Select Charts in the top tabs. To add the Title, select Chart Layout tab. Type in desired title. (My example the title is, “Type of Fall Leaves”. The image below is an Excel spreadsheet with the table format (A colum with categories and B column with corresponding numbers.) The screenshot also shows the bar chart with the title 'Type of Fall Leaves' with the same data in bar chart format. For additional information on Excel including creating and using Excel with a screen reader, view the post, All About Excel Spreadsheets.